We had an awesome weekend visiting M+J+L at their house just outside of Yosemite. Best view in the house. 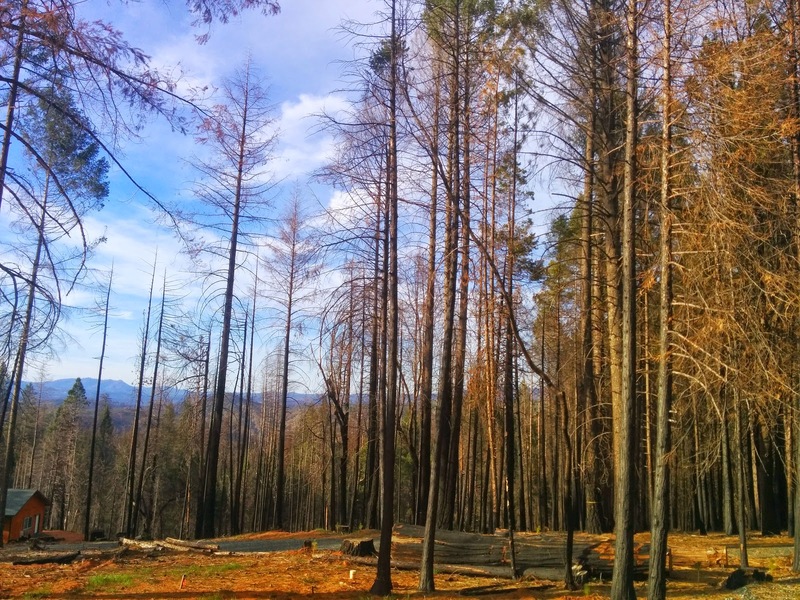 The impact of the 2013 Yosemite Rim fire is visible everywhere. We headed into the valley in the afternoon, parked at the small Sentinel Bridge parking lot, and got on the bikes after some crying about both kids wanting to go on mum's bike...It was the perfect time to ride the valley: technically winter so not too many people, but beautifully warm. Foreground: first Yosemite climb. 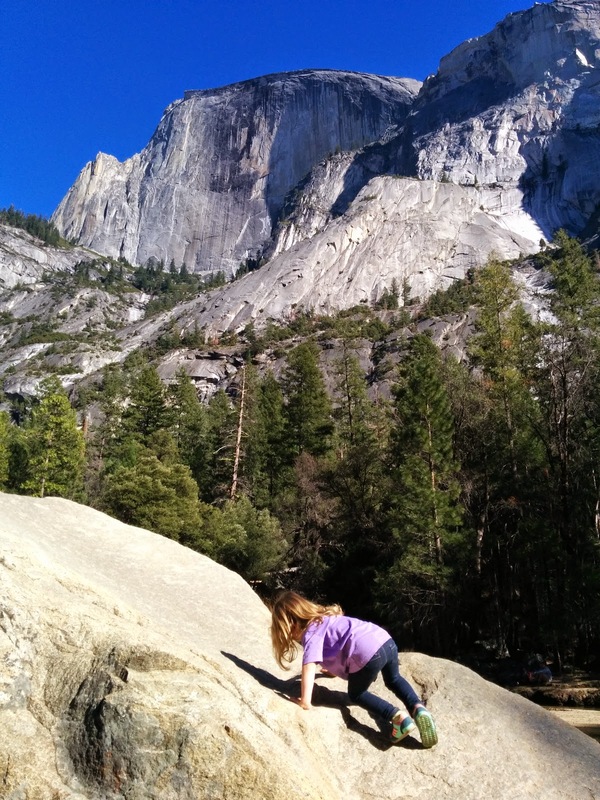 Background: future Yosemite climb (Half Dome). There's a great paved bike loop at the top (East) end of the valley that's marked on the map. We took it to the furthest Eastern point, which is at Mirror Lake. This was a fantastic way to get the kids around the valley, we covered much much more ground than we could have on foot. You can rent bikes and kid trailers if you didn't bring your own. Bring a lock, a number of places have bike parking, and there's a short walk you can do at Mirror Lake. 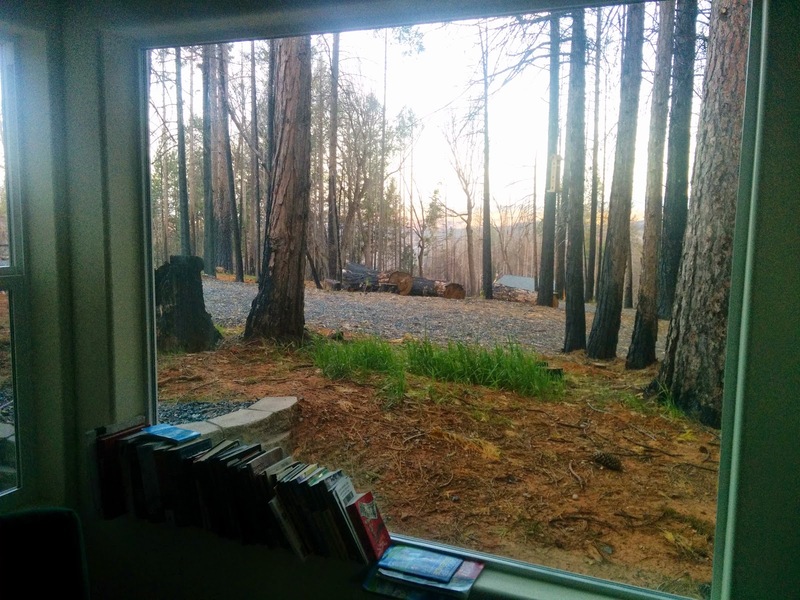 Back at the house: the fire and subsequent tree clearing has left no shortage of firewood. The next day we hung out at the house, took the kids to see the Salamanders in the creek, and helped out with some of the never-ending post-fire cleanup. Also found some time to ascend a tree like a rockclimber/lumberjack. The property should probably be called "M+J+L's forest adventure playground". Before heading home we went back to the valley to get a bit more riding in. 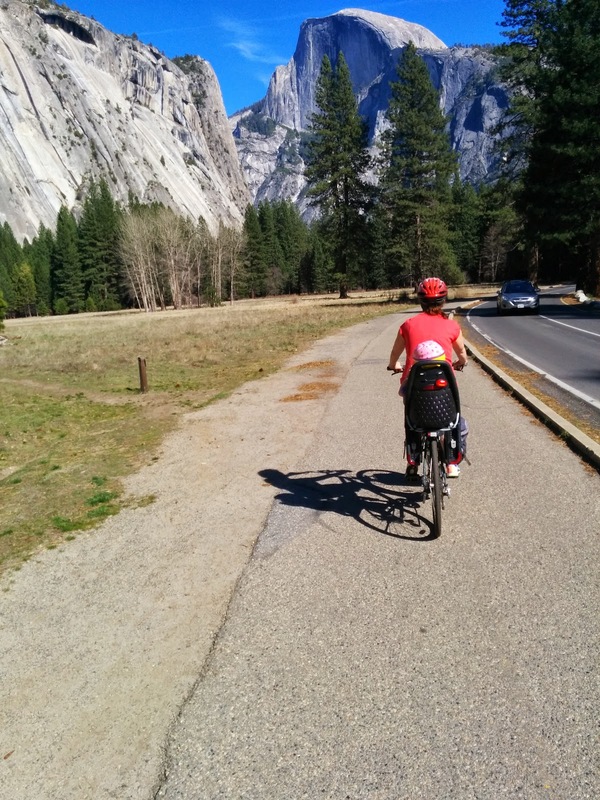 I'm including some info below for others who might want to ride Yosemite valley with kids. Starting from the same (but now deserted because it was a weekday) Sentinel Bridge carpark we crossed the river and rode the less-traveled path West towards El Cap. There's a path that's marked as "Other trail" on the valley map that's dirt with some bumps, but not enough to make the kids complain too much. It's probably unsuitable for road bikes, but anything else is fine. There's a small number of narrow parts (like where the photo below was taken near the river) that would be tricky for a bike trailer, but it's probably do-able with some short portage. You have to wind your way through Camp 4 a little, and there's a small creek crossing there. Our plan was to cut over to Bridalveil at Cathedral Beach, but we ran into a "no bikes" sign on the short connecting trail after crossing the road. This is the only bike prohibition sign we saw. The kids couldn't handle us doing the full loop down to Pohono Bridge, so we rode back on the road. There's no shoulder but it's a double lane one-way road so cars can easily pass.